Mouse anti Human Dectin-1 antibody, clone GE2 used in functional assays to assess bllocking activity for binding of A. fumigatus hyphae to human plasmacytoid dendritic cells. A. fumigatus hyphae are recognized by the mannose receptor, Dectin-2, on pDCs. Human pDCs were purified from PBMCs fractions using CD304-coated magnetic beads. (A) pDCs were treated with no inhibitors, dextran (1 mg/mL), mannan (1 mg/mL), laminarin (0.5 mg/mL) or mannan and laminarin for 30 minutes. The pDCs (5×104) were then incubated for 2 hr with A. fumigatus hyphae (5×104). The cell association was quantified by counting number of pDCs associated (touching or spreading over) with hyphae in 10 different fields. The percent cell association was calculated by dividing the number of pDC associated with hyphae by the total number of pDC counted and then multiplying by 100. (B) Same as in A except pDCs were treated with anti-Dectin-1 (100 μg/mL) and anti-Dectin-2 (100 μg/mL) antibodies for 30 minutes prior to incubation with hyphae. Data represent means ± SE of % cell association from three donors. *P<0.05. (C) Representative photomicrographs of pDCs incubated with A. fumigatus hyphae under the conditions described in panel B. From: Loures FV, Röhm M, Lee CK, Santos E, Wang JP, et al. 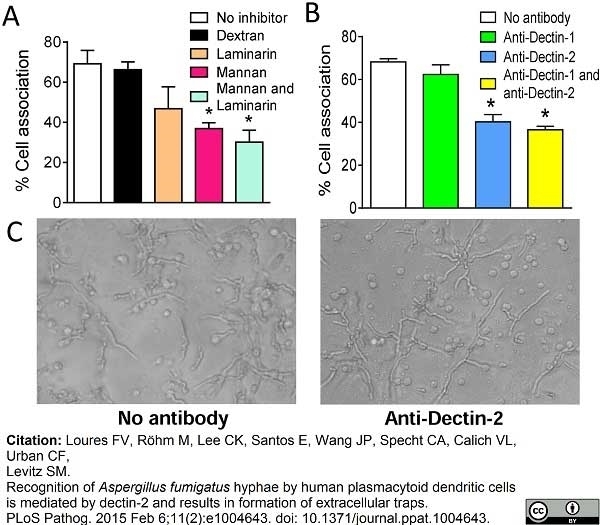 (2015) Recognition of Aspergillus fumigatus Hyphae by Human Plasmacytoid Dendritic Cells Is Mediated by Dectin-2 and Results in Formation of Extracellular Traps. PLoS Pathog 11(2): e1004643. Mouse anti Human Dectin-1 antibody, clone GE2 recognizes human Dectin-1, also known as beta-glucan receptor (βGR), a C-type lectin domain family member. It is a major pathogen pattern-recognition receptor that binds beta-glucans, glucose polymers that form cell-wall components or exopolymers of yeasts, fungi and some bacteria. Beta-glucans have also been used experimentally and therapeutically as immunomodulators that enhance resistance to bacterial, yeast, viral and protozoan infections, as well as tumor formation. Dectin-1 also acts as a co-stimulatory molecule on T-cells to induce their proliferation and is necessary for the TLR2-mediated inflammatory response. It is highly expressed on peripheral blood leukocytes and dendritic cells. Human Dectin-1 has two major (βGR-A and βGR-B) and several minor isoforms. βGR-A and βGR-B differ by the presence and absence, respectively, of a stalk region. Mouse anti Human Dectin-1 antibody, clone GE2 recognizes both major isoforms. Clone GE2 could be used to inhibit receptor function. NIH3T3 cells expressing full length Beta-glucan receptor. Spleen cells from immunised C57BL/6 mice were fused with cells of the murine SP2 myeloma cell line. Willment, J.A. et al. (2005) The human beta-glucan receptor is widely expressed and functionally equivalent to murine Dectin-1 on primary cells. Eur J Immunol. 35 (5): 1539-47. Harnack, U. et al. (2011) Yeast-derived beta-(1-3),(1-6)-D-glucan induces up-regulation of CD86 on dectin-1-positive human B-lymphoma cell lines. Anticancer Res. 31 (12): 4195-9. Loures, F.V. et al. (2015) Recognition of Aspergillus fumigatus hyphae by human plasmacytoid dendritic cells is mediated by dectin-2 and results in formation of extracellular traps. PLoS Pathog. 11 (2): e1004643. Kyrmizi, I. et al. (2013) Corticosteroids block autophagy protein recruitment in Aspergillus fumigatus phagosomes via targeting dectin-1/Syk kinase signaling. J Immunol. 191 (3): 1287-99.